507 "A" Relaxing Bliss! April 28- May 1 Open! Book Early! Gordon's Vacation Rentals Check out all our 5 Star reviews! 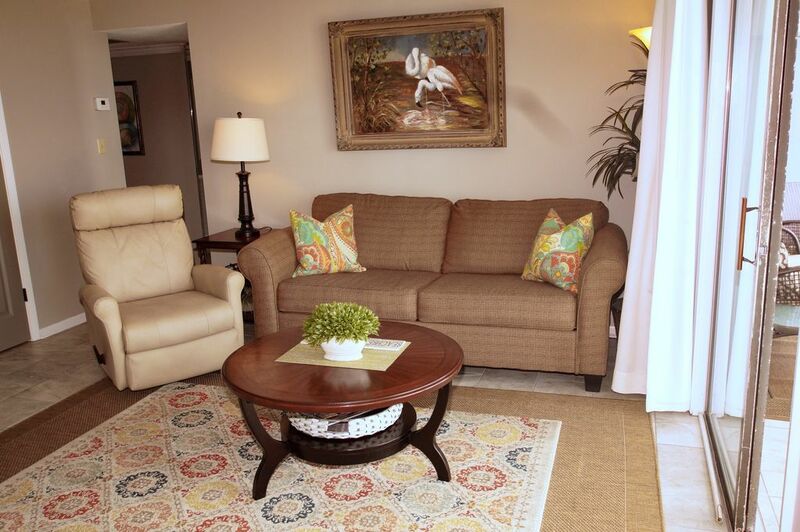 Come and visit 507A, a large deluxe 2 bedroom and 2 bath for a vacation you will not forget! The condo is located on the fifth floor and is decorated in a cute beach theme. The deluxe condos here are about 1000 sf, which we feel is perfect for couples or a family of up to 6 guests. You will have two sliding glass door in the Living room and one in the Master bedroom for floor to ceiling Ocean views. From the front bedroom and front door you have the views of the beautiful courtyard, pool and Little Lagoon. The kitchen is fully-equipped with all of the conveniences you would ever need on vacation. A washer and dryer are also provided for your laundry needs. The living room has a queen-size sleeper sofa,a recliner, cable TV, and a DVD/VCR combo. The master bedroom has a queen size bed, TV, clock radio and walking closet. Morning is perfect on the balcony for having your coffee as you plan your day’s activities at the beach or in town and watch the dolphins swim by. Second bedroom also has a queen bed. We also have a keyless lock, so no keys to keep up with during your stay. The complex boasts beautiful lush palm trees and flowers that surround the large pool with a double sided rock waterfall. The children's pool is steps away along with a hot tub for the adults. Charcoal grills and picnic tables by the Lagoon are perfect for grilling out by sunset.The complex also has two lighted tennis courts and shuffleboard with the equipment available at no charge at the front office. For the boaters, we have a boat ramp and two private piers, one with boat slips with a $20 boat launch fee per vessel. Boat ramp and slips for a $20 fee per vessel. We had a great time. Beautiful condo everyone was pleased. This is the second time we stayed in 507a. We truly enjoyed our visit. Fortunately the planned maintenance did not affect us at all. We’ve stayed at 4 different condos there at the Gulf Shores Surf & Racquet Club and this one was by far our favorite! The condo was very spacious and newly remodeled. Everything was perfect! Very Clean and Well Decorated!!! Loved it!!! Very Clean and well decorated. Loved it. First time, may stay again next year. Great views of the Beach. The condo has very nice updates and is very clean. The balcony is a good size and offers great view of the Beach, perfect for having your cup of coffee in am. The beach access is only a five minute walk from the building. Location is perfect , not to far from shops and restaurants. Overall enjoyed our stay. A very relaxing home away from home feeling. We loved it. Can't wait to go back and stay longer. The grandkids loved it so much. Such a clean organized beautiful place truely enjoyed it. The update on condo was great. Enjoyed the week so much. Looking forward to coming back next year. We had a great time. It was a pleasure staying in 507A. It was so pretty with all the remodeling. Thanks for letting us rent from you. Hope to be coming back July 13-20, 2019 if you will keep us in mind. Boat slips and 2 Piers on Site.